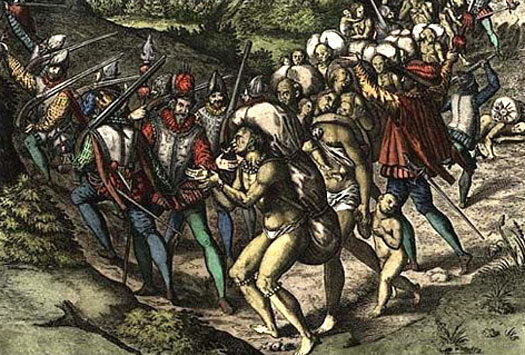 The Spanish conquest of Florida in North America's south-eastern region was a much more tricky affair than their conquests had been in the Caribbean and central America. The Spanish explorer Juan Ponce de Leon was the first Spaniard to reach Florida after he aided in the conquest of Puerto Rico in 1508, but it took until 1565 before a permanent colony could be established. This was after many failed attempts to make in-roads into the region thanks to staunch resistance by the Native North American tribes. With the Caribbean islands of Cuba and Hispaniola lying to the south, and the British Colonies and New France lying to the north, the region was never fully secure. French and British interests saw the colony exchange hands more than once, but in the end it was the growing threat from the United States which ended Spanish control. The Spanish explorer Juan Ponce de Leon is the first post-medieval European to sight Florida in 1508, mistaking it for an island. (The undocumented voyage of Prince Madog of Gwynedd is placed at 1170, making him the first to reach the region.) 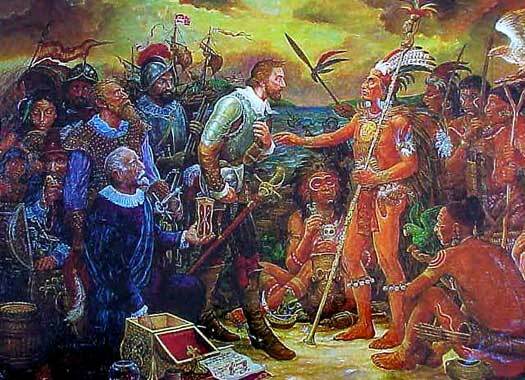 Ponce de Leon returns on 27 March 1513 to make his first proper landing there. and by 1514 is confirmed by the Spanish crown as the first governor. Also Spanish governor of Puerto Rico (1515-1519). Juan Ponce de Leon is killed by an arrow when exploring Florida's western coast, probably in the vicinity of Charlotte Harbour. It is a warning to the Spanish that this conquest will not be as easy as some others. The first chief of a new confederacy along the eastern seaboard is driven north to the Virginia area by Spanish colonists in Florida and surrounding regions. Once there, he takes over control of at least five other Indian tribes in Virginia. Upon his death his son, a young Wahunsenacawh, inherits the duty of ruling over the six communities which are known as the Powhatan confederacy. Hernando de Soto had arrived with Pedrarias Davila, first governor of Panama, in 1514. Then, in 1533, he had served as one of Francisco Pizarro's captains during the conquest of Peru. In 1538 he is given the governorship of Cuba and charged with the task of colonising the North American continent for Spain within four years (territory that later forms part of the modern United States). He leads the first European expedition deep into the territory of North America where, in a great arcing journey, he traverses Florida, Georgia, South Carolina, North Carolina, Tennessee, Alabama, Mississippi, and Arkansas. (Could it be this expedition and the clear signs that the Spanish are not going to leave that forces the pre-confederacy Powhatan northwards into Virginia?) After encountering greater and greater difficulties, de Soto dies of a fever on 21 May 1542. A French Huguenot expedition reaches the mouth of the St John river in Florida under the command of naval officer Jean Ribult. His second-in-command is Rene Goulaine de Laudonniere. Together they explore as far as South Carolina, where they establish the small colony of Charlesfort on Parris Island, before they return to Europe. The following year, the French Wars of Religion break out, and Ribult is forced to flee France for England. In 1564, Spanish supremacy in the chase for colonial conquests was coming to an end in North America, although they remained dominant for a while longer. With the Wars of Religion occupying the attention of France, the colony of Charlesfort suffered from neglect. Food supply became a problem after difficulties arose with the local native tribes. As a result, the explorer and Huguenot noble, Rene Goulaine de Laudonniere, now in command of French interests in the region, moved most of the colonists south into Spanish territory to found Fort Caroline (modern Jacksonville) as the capital of what was the southernmost arm of New France. The spot was near to where the initial expedition had arrived, at the mouth of the St John river. Ribult, now back in favour in France, is sent to save the colony. After his ships are attacked by the Spanish off the coast, a Spanish force of 800 troops backed up by settlers is landed on 28 August under the command of Pedro Menendez de Aviles, and they throw up defensive works around a Timucua village (modern St Augustine in Florida). With Ribult at sea chasing Menendez, the Spanish forces attack Fort Caroline, destroying the French colony. Spanish Florida was much larger than its modern day counterpart. It extended as far north as Parris Island in modern South Carolina (which the Spanish named Santa Elena). 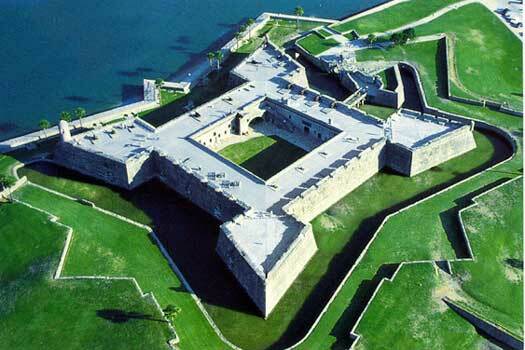 The capital was the Timucua village which had been fortified in 1565 and renamed St Augustine. To secure their control over Florida, the Spanish under Menendez not only destroyed the French colony at Fort Caroline, they also captured the survivors of Ribult's fleet. That was destroyed during the same hurricane that masked the advance of the Spanish forces on Fort Caroline, and in both instances, the Spanish murdered many of the Frenchmen they captured. They rebuilt Fort Caroline. Later Spanish governor of Cuba (1567-1574). In revenge for the shocking murder of the French colonists in 1565, French pirate Dominique de Gourgues gains revenge by attacking the now Spanish-held Fort Caroline. He captures the garrison and makes sure all of his prisoners are killed. The fort is again rebuilt by the Spanish, but abandoned permanently in 1569. The Chiskiak of the Powhatan confederacy are commanded by Ottahotin. They are located on the site of the attempted Spanish Ajacán Mission of 1570. In a complicated tale of deceit and murder on both sides, the Spanish hang eight Chiskiack in 1572, including Ottahotin's uncle, and the weroance seeks revenge. On hearing that the Croatoans have encountered white men, Ottahotin eagerly anticipates his chance to destroy them, but the main Spanish forces abandon this densely-settled area and concentrate on the Florida lands to the south. The first English colony in North America is founded on 5 August at St John's Bay, Newfoundland, by Humphrey Gilbert. The British Colonies slowly start to expand. The first serious attempts at converting the native Timucua to Christianity begin when Father Francisco Pareja arrives in Florida. Spanish Franciscans found a mission amongst the Apalachee natives (situated in modern Apalachee Province in northern Florida). The Spanish colony of Florida extends as far west as the outpost of Pensacola. Just forty-five kilometres further west is the French outpost of Mobile, part of their Louisiana colony. Migrated the Spanish colonists to Cuba. At the end of the Seven Years' War, under the terms of the secret Treaty of Fontainebleau of 1762, France cedes the vast and wild Louisiana Territory from the French Colonies to Spain. As part of the subsequent Treaty of Paris of 1763, Spain itself loses the colony of Florida to the British but are happy to do so as they have already been handsomely compensated with Louisiana. Melchor Feliu oversees the removal of the entire population to Cuba which is regained in exchange. On 6 July 1763, Britain handed back the captured island of Cuba to Spain in return for Florida and southern Alabama (part of New France) at the conclusion of the Seven Years' War. The borders of the territory to be handed to the British Colonies were never entirely confirmed and remained contested (in words only) until after the creation of the USA. Florida was divided into two halves, east and west. East Florida formed much of the previous Spanish colony, from the southernmost point near Cuba to the River Apalachicola, near Panama City. Its capital was the same as in the old Spanish colony, at St Augustine, still in the modern state of Florida. Last British Governor of Florida. As part of the Treaty of Paris which marks the end of the American Revolutionary War, Britain cedes East Florida back to Spain. The first British governor of West Florida was appointed in November 1763, and governed from the capital at Pensacola. Western Florida formed the region from the River Apalachicola, near Panama City, up to the western bank of the Mississippi. This included the western sections of the former Spanish colony and the easternmost sections of the French colony of Louisiana. Its borders were later altered several times, and today parts of it also lie in the states of Alabama, Louisiana, and Mississippi. Apart from a scattering of traders, the population in the hinterland was primarily native, of whom the most important in what is now Alabama were the Cherokee, Chickasaw, Choctaw and Creek. Thanks to lobbying by the governor, the British move the northern border of Florida to encompass the lower thirty per cent of the modern states of Alabama and Mississippi. The onset of the American Revolution hobbles the growth of population and the expansion of trade that this might bring. 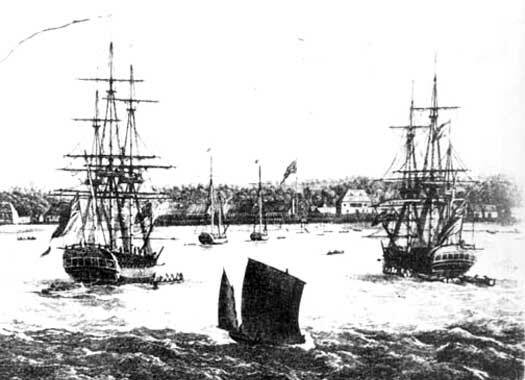 American privateers further hamper the flow of goods and immigrants to British territories. The apparent immunity of the province disappears when James Willing of the revolutionary US navy launches a raid through the province's back door, the Mississippi. Meeting almost no resistance, his force of about a hundred men destroy many plantations in the colony's western districts. Although his success is short‑lived, and Willing soon sees the inside of a British jail, his achievement alerts the British crown to West Florida's vulnerability, and extra troops are brought in. Bernardo de Galvez, the Spanish governor of Louisiana, invades West Florida as soon as he can after Spain declares war on Britain on 21 June 1779. He lays siege to Mobile's Fort Charlotte in March 1780, taking it after a strongly-defended thirteen day siege by former governor, Elias Durnford. Then Jose de Ezpeleta attacks the Pensacola garrison and Britain's native allies from Mobile (Alabama). As West Florida's last stronghold, Pensacola surrenders to Galvez in May 1781, ending British Colonial rule in West Florida. The province is occupied for the next two years and as part of the Treaty of Paris which marks the end of the American Revolutionary War, Britain cedes West Florida back to Spain in 1783. Spain made the most of Britain's war with revolutionaries in North America. As soon as was possible, Spanish troops attacked the sparsely-populated territory of West Florida, and they held onto their gains until the end of the war. Then the Treaty of Paris confirmed Spanish ownership of Florida, regaining for them what they had lost in 1763 and adding southern Alabama to it. Now, Florida's northern border with the newly-formed USA had been agreed by Britain as being positioned along the thirty-first parallel, but until 1795 Spain disputed it, wanting the larger 1763 border to be re-established. Ultimately, Spain climbed down. Spain officially retook possession of East Florida on 12 July 1784, after it was ceded by Britain. The capital was retained at St Augustine, which was now approximately two hundred and twenty years old. Provisional governor between May to June. Former governor of West Florida. The USA asks the viceroy of New Spain to remove his Spanish troops from New Orleans so that it can take possession of the area up to the River Sabine. The viceroy agrees and the troops are removed. By this stage New Spain already encompasses Mexico, plus Arizona, California, parts of Florida, Nevada, New Mexico, Texas, Utah, and areas of Colorado, Oregon, and Wyoming. During the later stages of the Napoleonic Wars in Europe, Spain is allied to Britain, and despite a promise not to become involved in Anglo-US affairs, Spanish forces in East Florida are viewed with extreme distrust by the people of neighbouring Georgia. Between June 1812 to June 1815 frontiersmen from the US state involve Spain in the Patriot War as they attempt to expel the Spanish. Ultimately they are unsuccessful in the face of professional Spanish troops, with the conflict being overshadowed by the subsequent US war with Britain. However, southern Alabama is appended to the US Mississippi Territory in 1814. Jose Maria Coppinger's term of office lasts until 10 July 1821. Along with a small section of West Florida, East Florida passes to the USA to become a state within the union. It never again changes hands. British West Florida was captured by force when Spanish troops invaded the region between 1779-1781. They managed to hold onto it for a two further years, with a governor being installed on 9 May 1781. As part of the Treaty of Paris which marked the end of the American Revolutionary War, Britain ceded West Florida back to Spain in 1783. The capital at Pensacola was retained. Governor of occupied British West Florida (1781-1783). Later governor of East Florida. On 30 April 1803, Napoleon Bonaparte, first citizen of France, effectively sells off the remaining parts of New France when he hands Louisiana to the USA for 80 million francs. While the USA also claims the former French territory which has been part of West Florida since 1763, Spain refuses to hand this over. Many British settlers in Florida remained behind when the colony had been handed back to Spain in 1784. Since then, American settlers have also been edging into Florida, and both groups either resent Spanish control or ignore it altogether. Together, they rebel and establish the republic of West Florida. Despite the name, the republic is located in southern Alabama and Mississippi and eastern sections of Louisiana. Governor of the Republic of West Florida. On 27 October, parts of West Florida are annexed by the USA, which claims the region as part of the 1803 Louisiana Purchase. US forces take control of the republic of West Florida's capital of St Francisville on 6 December, with Baton Rouge falling four days later. Spain continues to protest at the capture but it doesn't regain the territory. The area around Mobile is officially annexed to the Mississippi Territory, and the captured territory is slowly increased in size over the next few years. The United States occupies West Florida during the First Seminole War, with the American colonel, William King, being appointed governor between 26 May 1818 to 4 February 1819.With the USA keen to support rebels in New Spain, William Robinson occupies Altamira and Tampico but is taken prisoner by Spanish royalists and is sent to Cadiz. He escapes at Gibraltar with British help but as a consequence Spain and the United States sign the Adams-Onis Treaty on 22 February 1819. Governor from Feb 1819-17 July 1821. The last European governor of East Florida holds the post between 1819-1821. As a result of the signing of the Adams-Onis Treaty, the border between Spanish and US North America is established, with the USA gaining Florida and renouncing its claim to Texas, and Spain renouncing its claim to Oregon. A small section of West Florida is joined to East Florida to become the Florida Territory, while the rest becomes part of Louisiana.